Tai Chi Master Domingo Colon has put his many years of experience as a physical therapist, adaptive fitness specialist, and Tai Chi instructor to excellent use in this succinct workbook of Tai Chi exercises for seniors. 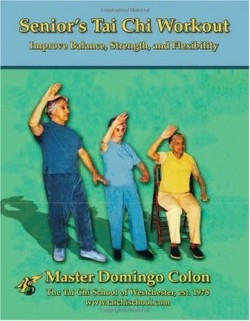 Although he is careful to advise potential users to consult with their family doctors first, Colon is confident that following his directions will take readers on “an exciting journey to increased health, strength, and peace of mind.” He has made the journey for seniors that much easier by using a large typeface, including simply written instructions, and providing more than seventy individual photographs showing various sitting and standing positions for the recommended exercises. With brief asides to the history, principles, and concepts of Tai Chi and its development, Master Colon explains that the purpose of Tai Chi is “to effect a profound transformation of your body and mind, not merely the rote memorization of a sequence of movements, as is so often the case in other exercise classes.” To achieve this objective, he advises that exercises be done with a slow, smooth, soft approach. He also stresses the need to be in harmony with nature and not to strain or overdo any exercise. Colon includes a detailed section on the use of his book, noting that the workout may be performed alone or in groups, but is best practiced for several minutes daily instead of in prolonged sessions. At the core of the book are the Master’s workout practices, consisting of the Wu Chi sitting meditation, the ten Chi Kung sitting and standing exercises with memorable names like “Golden rooster stands on one leg,” and the ten standing postures of the Wu Chi Tai Chi Form, with some equally intriguing titles like “Shake out the sheet,” and “Wave your hands like clouds.” All of the exercises have accompanying illustrations. Also helpful and inspiring confidence in the exercises are several pages of the author’s background and his concern for his readers by advising them to contact his him by phone, e-mail, or mail. Appendix A is additionally useful for its discussion on the nature of meditation, the appropriate preparation, the techniques of progressive relaxation, and the correct breathing exercises. Appendix B lists the specific benefits to be derived from each exercise. For example, “The crane kicks out” promises to “improve your balance, strengthen your legs and hips, increase your flexibility, stimulate your lower body circulation.” Appendix C lists the breathing patterns for the Wu Chi Tai Chi postures, and it is followed by a glossary of related terms. There are even sections for “Other Resources,” an application form for a “Health Tips Line,” and contact points for enrolling in a free class with the Master at the Tai Chi School of Westchester in Bronxville, New York. Written with an obvious attention to the needs of seniors, Master Colon’s book is an excellent introduction to the philosophy, art and science of Tai Chi for seniors willing to observe all of his instructions for attaining improved balance, strength and flexibility.